What a difference a day makes! 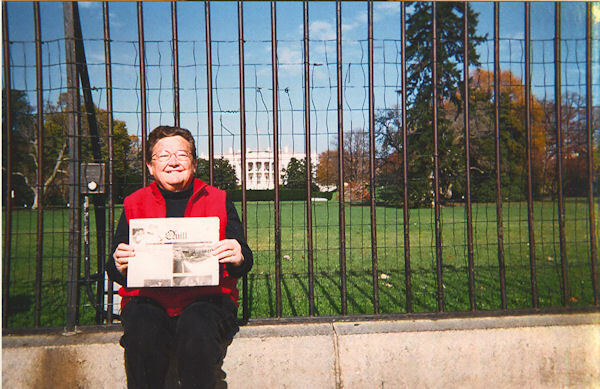 On November 17, 2009 Linda K. Louden, Apache Junction, Arizona (a La Harpe girl) was on the outside of the White House looking in. The next day she was an invited guest at the White House attending a tea hosted by Mrs. Michelle Obama to honor "Women in the Military." Linda was among forty women veterans and one hundred active duty military women attending. Each guest had an opportunity to speak to the First Lady, Dr. Jill Biden, and Homeland Security Secretary Janet Napolitano, speakers at the tea. When you go on a trip, take "The Quill" along and have your picture taken with it, then send it to us. Let's see where all "The Quill" can travel.